I can't think of anything better than when a company hires you to do exactly what you love to do. Can you?! This was the case a few weeks ago when Oliberte asked me to help design and put together a gift for attendees at an upcoming conference here in the city. Oh, you want me to dream up a craft, then meander around paper stores testing out products and pretty pens and then purchase said things and put them together for you? [cut to me doing a full on song and dance around my apartment!] I was convinced they had been given a key into the inner workings of the 'dream day' section of my thoughts! Little background :: Oliberte is the first company to make premium leather shoes in Africa using only African materials and then directly linking the sale of those shoes here in the states to job creation back in Africa. It's a smart model... as the model doesn't just aid Africa, it helps create opportunities in Africa (BIG difference). Each shoe is hand stitched in Ethiopia from local free-range cows and sheep. Most recently, they have expanded to include some really slick men's leather bags. Given the simplicity of the company, their main focus of creating jobs and incomes for families...... we decided it was best to create a very earthy and cost efficient piece. Their motto isn't to be flashy, but to create sustainability. I'd say this piece conveys that perfectly! - Using an ink jet printer (or go to your local Staples printing center), print out the paragraph or photo, onto the wood paper. - Holding the paper horizontal (or landscape orientation) fold the side in a third of the way. Rotate the paper so it's vertical (the tall way) and fold the top and bottom sides in, being sure to tuck one side under the other. I made sure that one side only went halfway across the other as to create a place for the wax stamp to sit. - After you've passed the hours folding away (I watched a movie while doing these! ), then prep the wax stamp. - With wax stamping, be sure to have some ice cubes in water on hand to cool off the stamp in-between uses. Stamp each, holding the stamp for 30 seconds until it cools and dries. 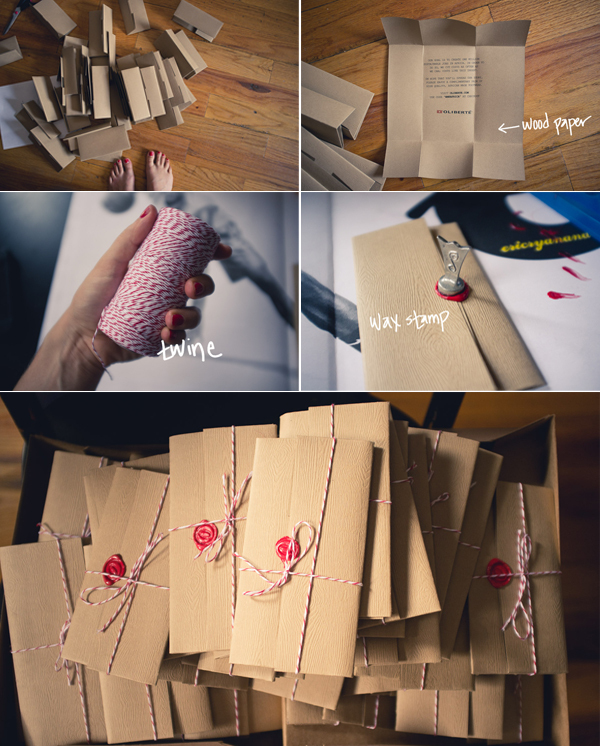 - After stamping, measure and cut the twine to the desired length. - Tie each folded piece now with the twine into a bakers cross. Basically wrap the twine around length wise and then twist, then wrap it around width wise, then tie in a bow.